Our student Diego Soto Martín has presented his MSc thesis "SwarmCity: control y monitorización de ciudades con enjambres aéreos" ("SwarmCity: control and monitoring of cities with aerial swarms"). Our student Javier Real Valdés has presented his BSc thesis "Tratamiento y visualización de datos urbanos obtenidos por un enjambre de drones" ("Treatment and visualization of urban data obtained by a drone swarm"). This work was focused on the treatment of the urban data provided by the aerial swarm, such as measurements of temperature or contaminant gases and detections of cars or pedestrians. This treatment aims to remove the redundant data and discover the relevant information. For this purpose, it applies Gaussian processes and neural networks. Gaussian processes are used to fuse the data provided by drones and obtain information referenced spatially and temporally. The spatial resolution and temporal window must be tuned to the specific variables to obtain valuable information. For instance, the spatial and temporal variabilities are wider for cars and pedestrians than for climate and pollution. Convolutional neural networks are applied to analyze the generated maps and determine the points of interest. These neural networks are trained with a set of maps manually tagged by an operator. Therefore, these evaluations have not only an objective part (e.g. the points with higher traffic are remarked), but also a subjective part (e.g. the operator choice between multiple traffic jams). Finally, an immersive interface was developed to visualize the information of the city. This interface takes advantage of virtual reality to reproduce the city and overlap the maps of temperature, pollution, traffic and pedestrians. The resulting interface was comfortable and intuitive as shown by the following video. We are preparing a scientific paper with the full details of this work! Our student Fernando Cipriano Díaz has presented his BSc thesis "Algoritmos de recolección de recursos mediante enjambres de robots terrestres" ("Algorithms for resource collection through ground robot swarms"). 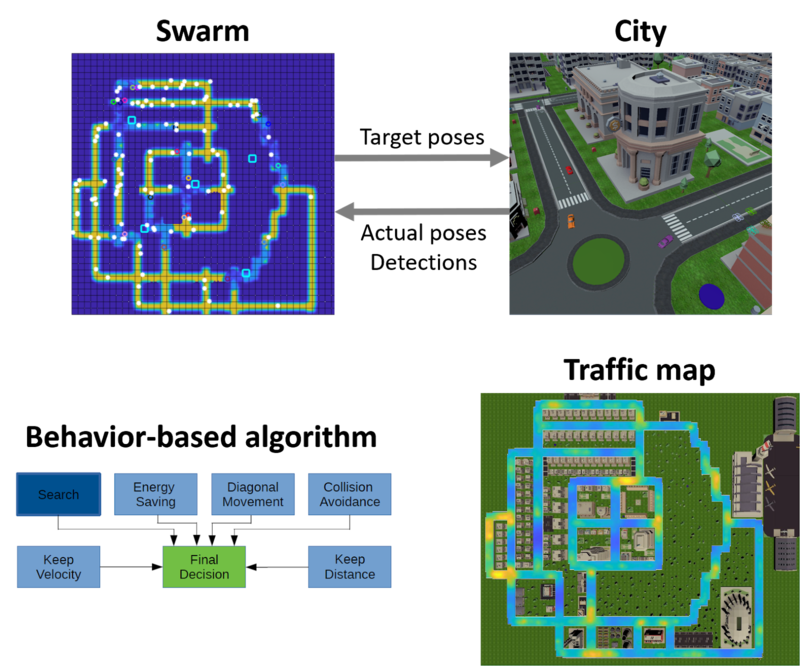 This work has explored some of the key points of SwarmCity project, but developing and applying them in a foraging scenario with a ground swarm. Specifically, fourteen strategies have been developed to lead the robots to collect the resources, taking into account behaviors such as random move, come back to resources, area coverage, manage energy... These strategies have been developed as iB2C networks and implemented in Python with py-iB2C library. The developed strategies have been integrated in ROS and tested in ARGoS, which is one of the most common simulators for multi-agent systems and robot swarms. This simulator has been used to evaluate the strategies with multiple fleets (from 5 to 25 robots) and resources (random, clustered and combined distribution). The results allow to compare the strategies in terms of resources collected in a certain time and time required to collect all the resources. This work has familiarized us with behavior-based architectures, as well as has shown their potential in a widely-used testbed. We will work in the following months to transfer the results of the work to SwarmCity. SwarmCity v2.0 has been released! Selection of number of cars. Respawn of accidented and blocked cars. Generation of crowds in certain locations and moments. Selection of number of drones. This is the Python implementation of iB2C (integrated Behavior-Based Control) developed by Pablo García Auñón. This architecture can be used to develop and execute behavioral networks to control intelligent agents. The Python library allows to easily create behaviors, implement them in networks and execute them in simulators. Create new behaviors from scratch, implementing the transfer, activity and rating functions. Create networks using the already implemented behaviors or new ones. Save specific behaviors and reuse them in another network. Save networks and use them as behavior modules. SwarmCity v1.0 has been released! Detection of cars and people with their main features. Measurements of temperature and humidity. Measurements of particles, COx, NOx and SOx. Export of messages to ROS through rosbridge.